Its January, you have likely spent the holidays eating, drinking and saying too much. Now its January maybe you are regretting that indulgence, making promises to be better, to eat better and to take better care of yourself? This introduces a mini-series on feeling better this January, beginning with a special piece on vitamin D.
Vitamin D is- as the name suggests- is a vitamin, and it is mostly gotten from the sun. Which is great- if you live on the equator- if you live in sunny, sunny England however, this is a little problematic. There are of course dietary sources of vitamin D- eggs, liver and oily fish. Milk commonly has vitamin D added into it artificially (which is NOT a bad thing!) and some cereals do too. Vitamin D is important for health for many reasons, one of which is that you need it to absorb calcium. Calcium, as I am sure you are aware, is important to maintain healthy teeth and bones, as is vitamin D. Low levels of vitamin D and calcium are associated with lower bone mass and a risk of breaks. You stop laying down new bone after the age of 21-25, so you are stuck with what you have after this age, so it is important to ensure that young adults and teenagers get adequate amounts too. Inflammation is linked to many diseases, including heart disease, cancers and diabetes. It has been noted that low levels of vitamin D and higher levels of inflammation often occur side by side, which may indicate that vitamin D reduces inflammation (or that vitamin D is reduced by inflammation). 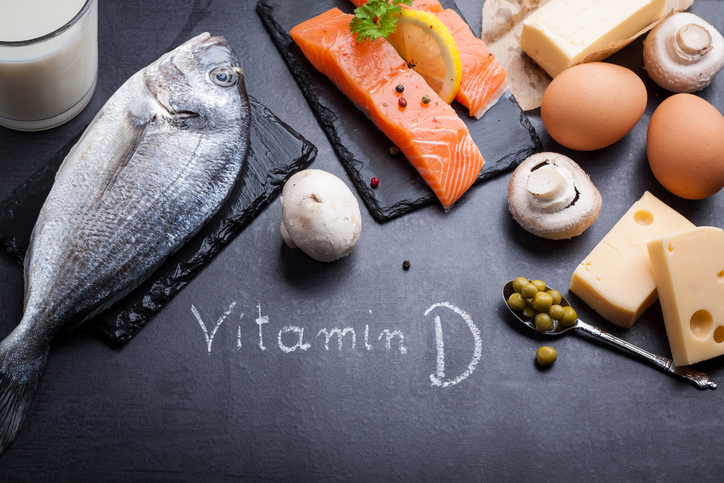 It is also often seen that people with depression or other mental health problems have low levels of vitamin D, so some clinical trials were conducted supplementing these people with vitamin D. These provided mixed results, some found it was extremely successful- others not. In essence, the amounts that have been tested are the same as is recommended by the government- so even if there is no effect- what is there to lose? The department of health recommends that everyone in the UK should consider taking a supplement of 10 IU (international units) or vitamin D a day in the winter months (if you have pre-existing medical conditions you should consult with your GP before starting any new medications). People who are at particular risk e.g those who are housebound or live in nursing homes should consider supplementing all year around. It is possible to get enough vitamin D in the winter from diet alone- so maybe its time to get some salmon or mackerel in? As always here is the British Dietetic Associations fact sheet on vitamin D.
Top tip: If you don’t like oily fish, remember that strong fish take strong flavours- see my dad or Kevin for suggestions!